So, I didn’t have a decent ballpoint pen… well, that’s not strictly true. I have a Cross Century II ballpoint in black lacquer, and it’s a lovely pen. It’s just that Cross refills, which you are limited to with Cross pens, are a bit like a lucky dip in your cat’s litter tray—you know that whatever you’re going to scoop out will probably be unpleasant, but it’s a litter tray (or a mass-produced Cross, sold in huge numbers everywhere), so what do you expect? The pressurized Fisher refills can be somewhat expensive, but they seem to last longer than a typical ballpoint refill. Knurled grip, to stop my fingers slipping when writing. Not too expensive, but negotiable for the right pen. A tasteful color, black, silver, silver and black. Not orange or something that’ll put me off my coffee. 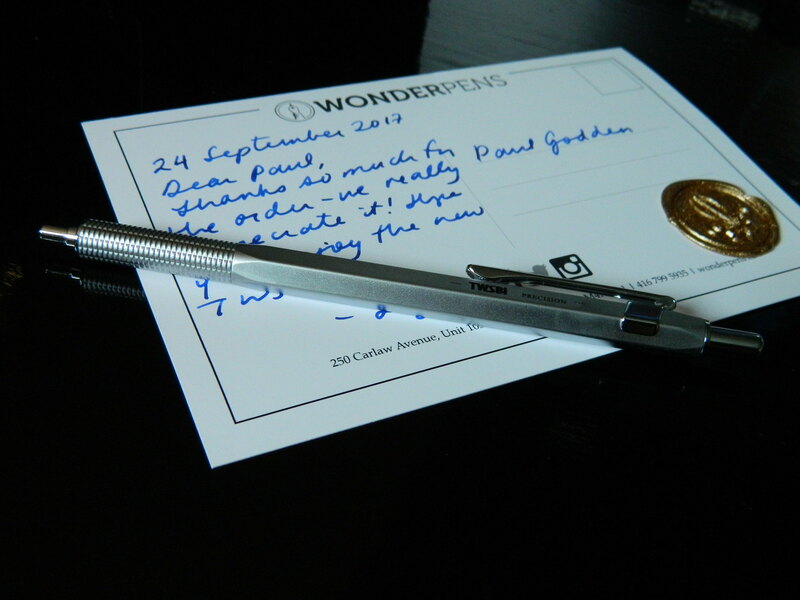 Thus, my searches on the interwebs for an online store, based in Canada, that can ship fairly quickly and reliably, with competitive prices, and excellent service… brought me, once again, to the Wonder Pens web site. Honestly, this really isn’t some sort of commercial tie-in that gets me anything, these guys just seem to run the only decent, Ontario-based, online stationery store I can find. 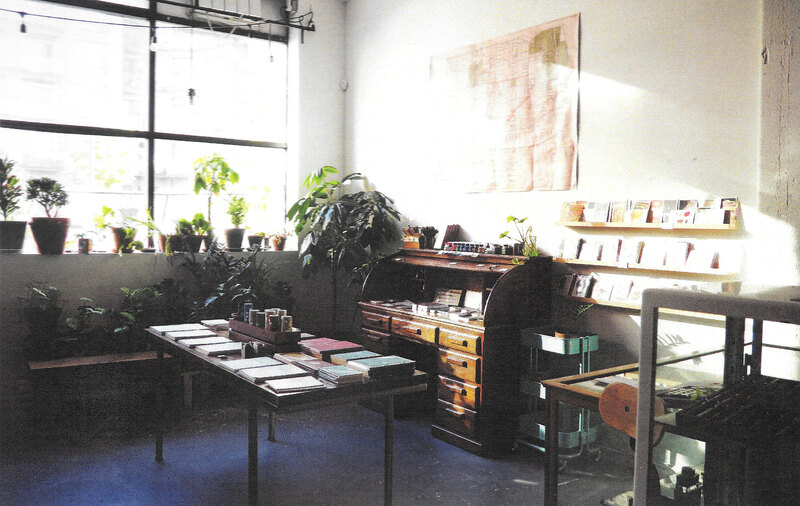 Other people have great stores… four hours drive away, but no real online purchasing options. There are one or two outside of Ontario, but Wonder Pens are in my home province (which makes for quicker deliveries), and mostly have better pricing. I rest my case. I narrowed my search down to two possible candidates. 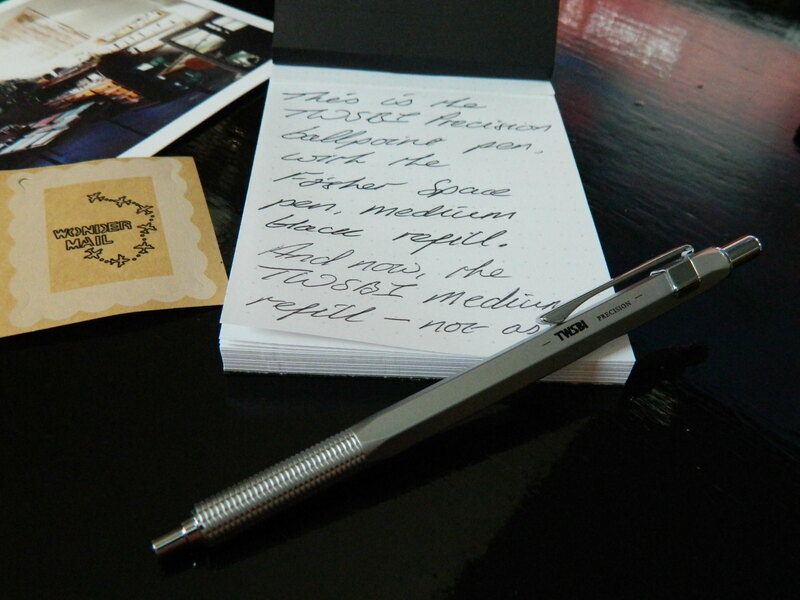 The first potential purchase was the Caran d’Ache 849 Ballpoint in silver. At the time of writing (2017, September 21), this pen was being sold at $35.00 (Canadian, plus taxes and shipping). 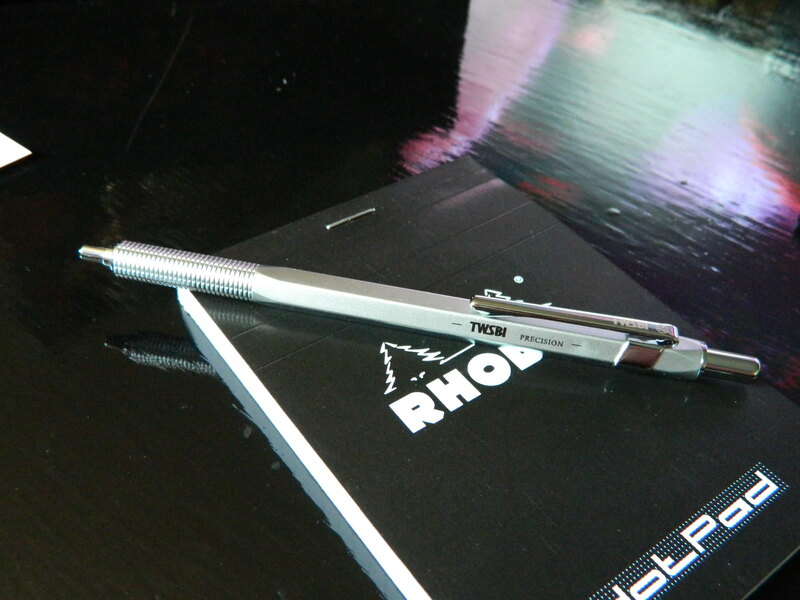 The Caran d’Ache 849 comes with their proprietary Goliath refill which they claim can write up to 600 A4 sheets of text. But what if I didn’t like it? Would it take a Space Pen refill? At 130mm (5.12in), the 849 was certainly long enough, but it weighed in at about 13g (0.44oz; according to the Wonder Pens web site); which was a lot lighter than any other pen I own, and that didn’t appeal to me at all. 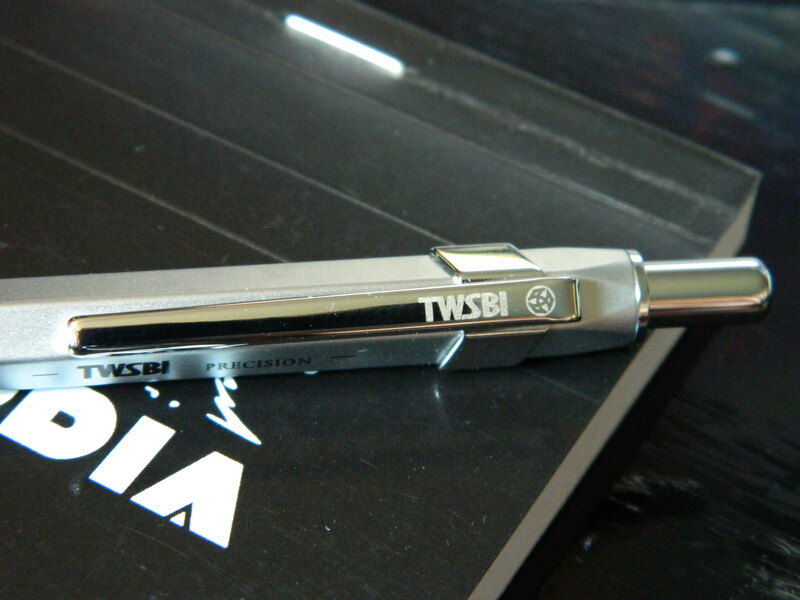 The alternative, for $34.50 (Canadian, plus taxes and shipping; 2017, September 21), was the TWSBI Precision Ballpoint in silver. It’s also worth mentioning that this price was almost half that of one or two other Canadian online retailers. 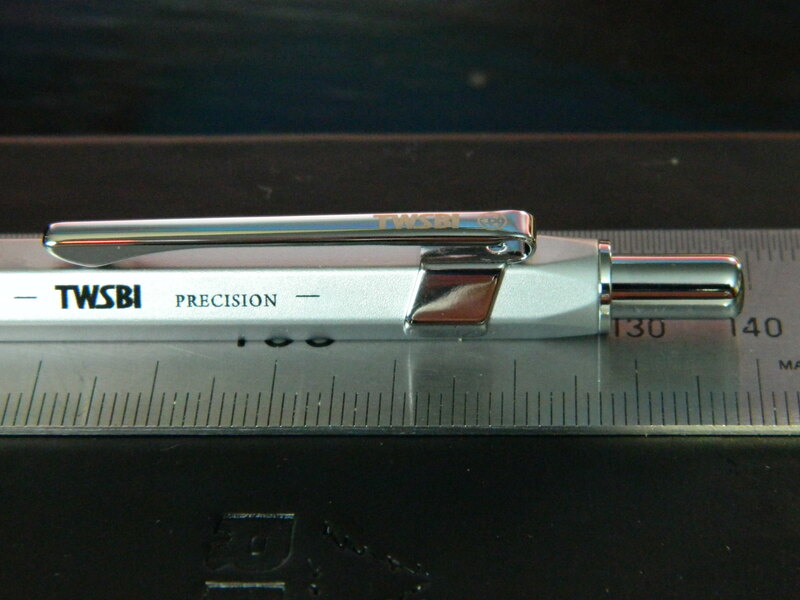 The pen had an all stainless steel body, apparently measured about 140mm in length (5.51in), 8mm (0.31in) diameter, and weighed about 26g (0.88oz). 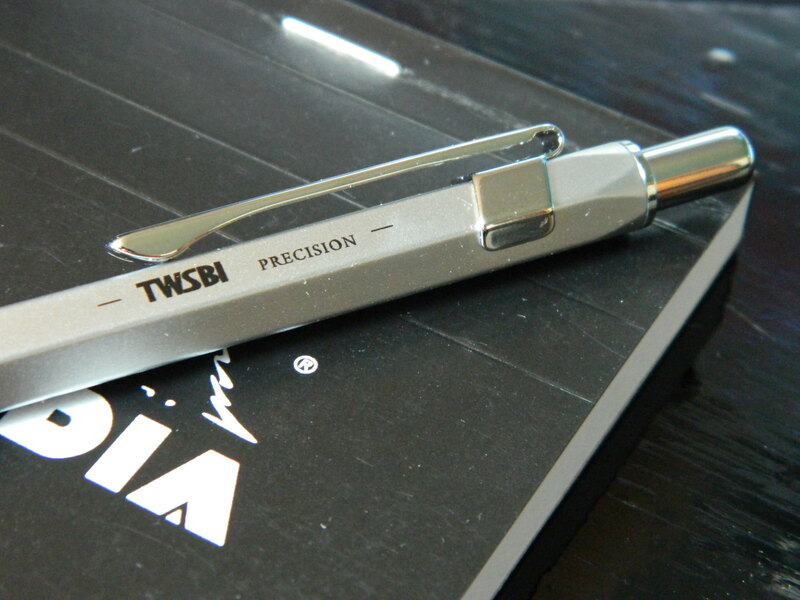 It was difficult to find any of the usual sites that had reviewed the TWSBI Precision Ballpoint, but the customer reviews on Amazon were almost unanimously good, as were those for the same pen in black. 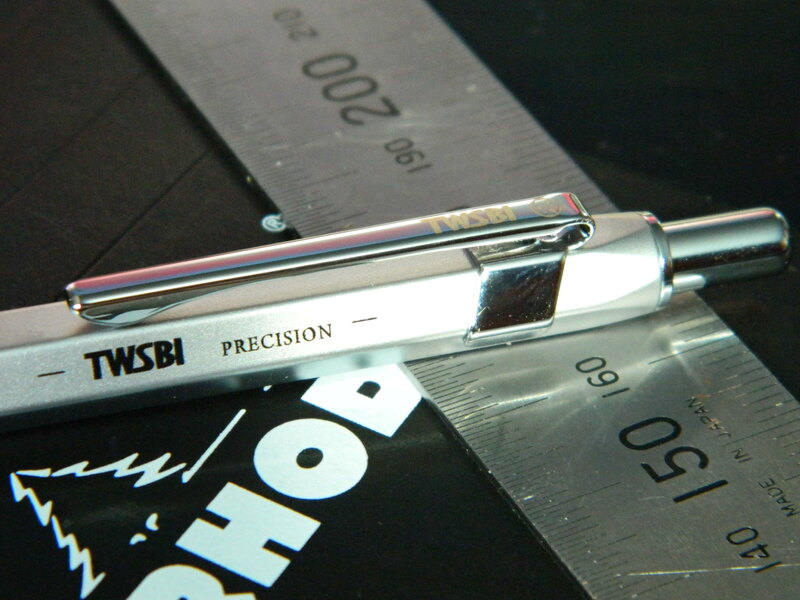 TWSBI’s Precision range also includes mechanical drafting pencils, which use almost the same metal body (sans ballpoint mechanism etc, obviously), which I might also try out some time. Anyway, another TWSBI it would be, with a Fisher Space Pen refill, in medium, with black ink. The pen came in TWSBI’s usual plastic clam shell box, snugly packed into the foam liner, along with a spare TWSBI refill, to add to the one already in the pen; making a grand total of two (who said qualitative researchers can’t get quantitative when they have to?). I was keen enough to see what they would write like, but I was always intending to Space this pen out. TWSBI’s minimalist packaging is also pretty welcome. 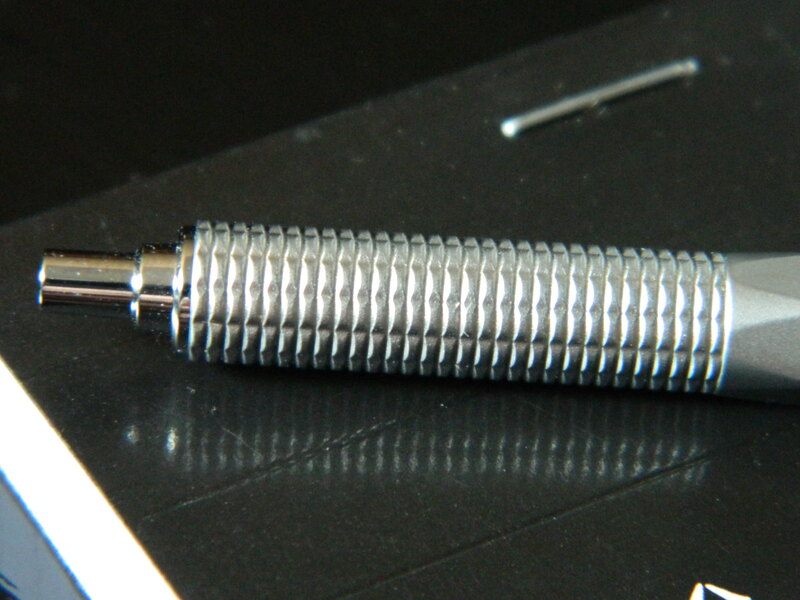 From the outset, the Precision feels like a well-engineered, high-quality product. The weight of the pen is well-distributed, and the hexagonal barrel is comfortable in the hand, and means that this pen is unlikely to just roll off your desk. The cylindrical knurled grip is equally comfortable—not too pronounced, just right for extended periods of use. 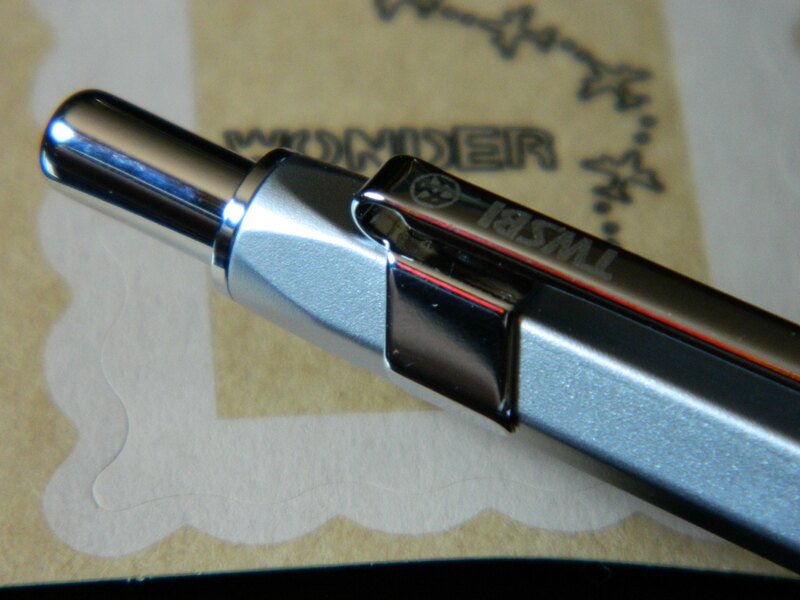 The barrel has the TWSBI name and model along one side, just adjacent to the clip. The clip is strong, without being too tight to use, and holds the pen firmly in a shirt or jacket pocket. 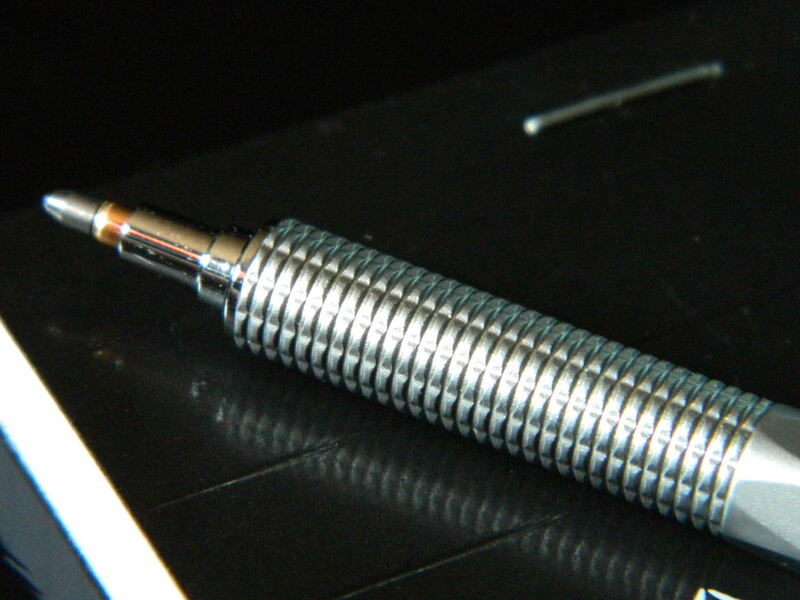 The knock extends and retracts the nib smoothly and reliably, with a satisfying click on each press. There’s no movement at all to the mechanism at any other time, no rattling in the top of the barrel, or moving when the pen is tilted: good engineering, and high manufacturing standards. The pen accepted the Fisher Space Pen (Parker G2-styled) refill, with absolutely no issues whatsoever. But if you do this yourself, remember to use the supplied plastic adapter for a proper fit—and don’t throw it away with the packaging, so that you have to look through the wastepaper basket for a tiny plastic widget. I didn’t do that of course. What’s It Like To Write With? And the Space Pen refill wrote beautifully… even upside down. I also tried the TWSBI medium refill, just for the sake of comparison. The top three lines of the graphic below are written with the Space Pen refill, and the bottom three, are the TWSBI refill. I didn’t like it much. 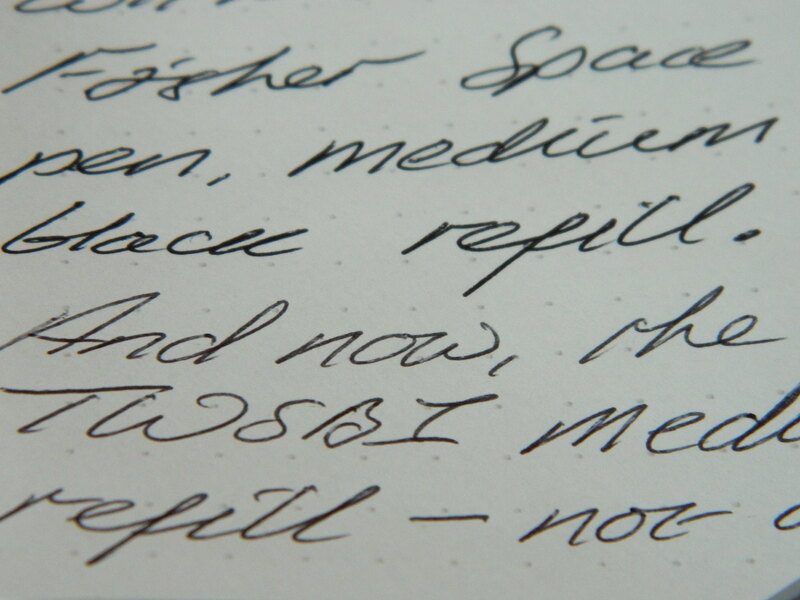 The TWSBI medium refill was finer than the Space Pen, and noticeably rougher to use on the paper. It also didn’t much care for trying to write upside down. No, I was definitely glad to have bought the Space Pen refill with this pen. Even the richer, deeper black of the ink was more to my taste. The pen sat evenly weighted in my hand, and the combination of build-quality, and that refill, let the nib flow across the paper. I liked this combo a great deal. If we’re being precise here, I would also say that the pen doesn’t quite measure 140mm (with the nib retracted), and with the nib extended, it’s about 142mm—just saying. They got the diameter right though. This is a nice ballpoint, and great value for money. It’s a direct competitor to the Caran d’Ache 849, and (in my opinion), beats it hands down for design, length, weight, and its ability to use the Parker G2-styled refills without even the hint of a problem. I should also make it clear that I don’t actually know if the Caran d’Ache 849 takes a Parker-style refill. But given that its usual refill is the Goliath, I have my doubts. If anybody knows for certain, please comment below! Of course, the price of the Fisher refill pushes the overall cost to about $45.00 (Canadian), which is $10.00 more than the Caran D’Ache 849, but I think it’s more than worth the extra expense for what you get. In a few weeks, I’m going to be flying across the Atlantic to visit my family in England, for the first time in years, and whilst the fountain pens will remain un-inked during the flight, the TWSBI Precision will be the pen I use for filling out those customs forms before we land. Excellent review, thank you. I’d never even heard of this, so I very much appreciate it. I may be a fountain pen fan, but I enjoy gel pens and rollerballs, and even a decent ballpoint. I switched from a purse fountain pen (Pilot Prera) to a purse ballpoint (Lamy Pico) after three successive Prera pens proved they weren’t up to being carried around. The Pico is perfect for this, doesn’t need any special handling, and looks great (for my tastes). I’m thrilled with it. The other ballpoint I’ve always had my eye on is the Caran d’Ache 849 — just like you. 🙂 But I decided I only really need one nice ballpoint. It is hard to spend a lot on ballpoints when you get so many free or low-cost anyway. 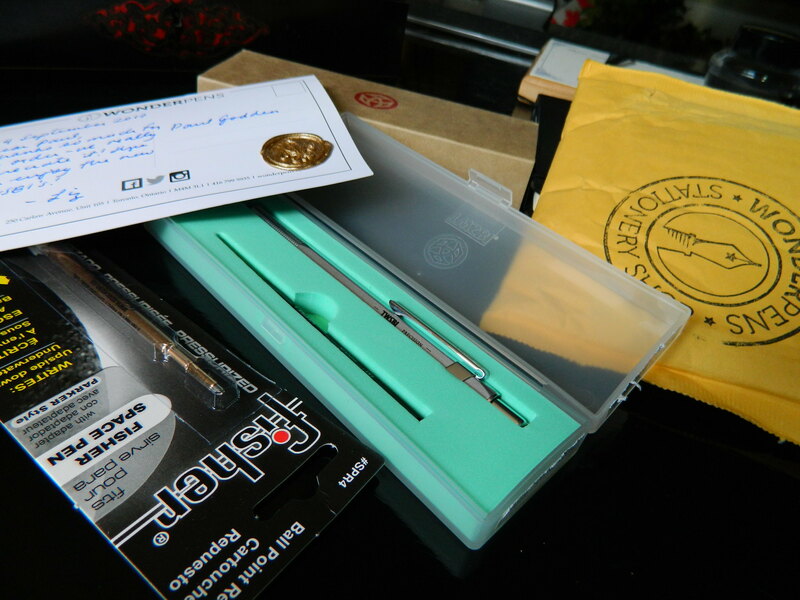 Thank you… as you posted that, I was half-way through enjoying your Pelikan Hubs write-up. I’m a bit jealous, I’d have a four-hour drive to get to anything that much fun over here! Yes, I liked the look of the Caran d’Ache, but the size/weight/refill question tipped me over to the TWSBI. Maybe one day. I also know what you mean with regard to buying ballpoints… I have one other – strange – ballpoint pen, a Smith & Wesson “Tactical” pen; which I found, in pristine condition, on the floor of a deserted car park! I’ll probably review it one day, just for the fun of it. Nice review from a fellow Canadian. I found your site because I was looking for this particular pen. 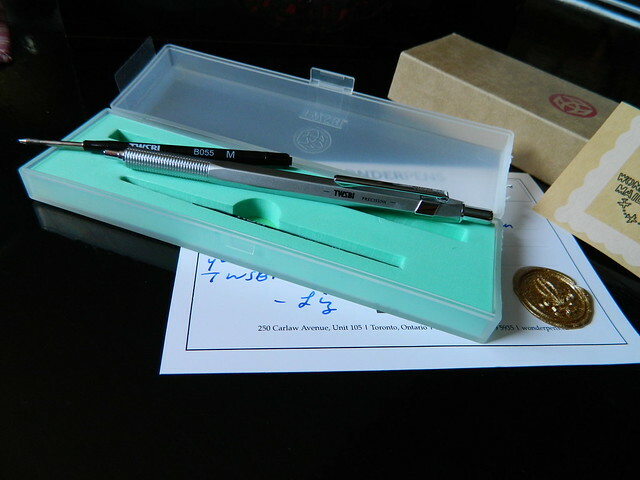 I own 2 Caran D’Ache 849’s (one is an 849, the other is an Ecridor….which is the same but has a sterling silver finish and a nice engraving) and love them to bits, especially with the large tipped Goliath refill. I makes writing with them very smooth and similar to a rollerball. However, I’m always looking for a new pen to try in the sub $50 CAD category and this one looks like it might work. Plus, I really like the Pilot Gel refills and this pen would work with those. I’ve read various reports online of getting Parker refills to fit with the Caran 849. I’ve tried….multiple times and never had a great experience with it. The refill is too long, so your options are to unscrew the knock to give it a bit of extra room, but it doesn’t feel great. I ended up filing down the plastic end to shorten it and it did work ok, but would get caught and stick a few times which prompted me to swap it back out for the Goliath. Sometimes, you can snag the unpopular Caran 849 colors on sale. I’ve bought a few for co-workers (they always ask “what kind of pen is that, it writes so nicely” when they borrow mine) on sale for $15 CAD in the past at my local store. They are usually bright pink, orange etc but at that price they are a steal and a great little gift for someone who wants a nice pen. Thanks for commenting James! 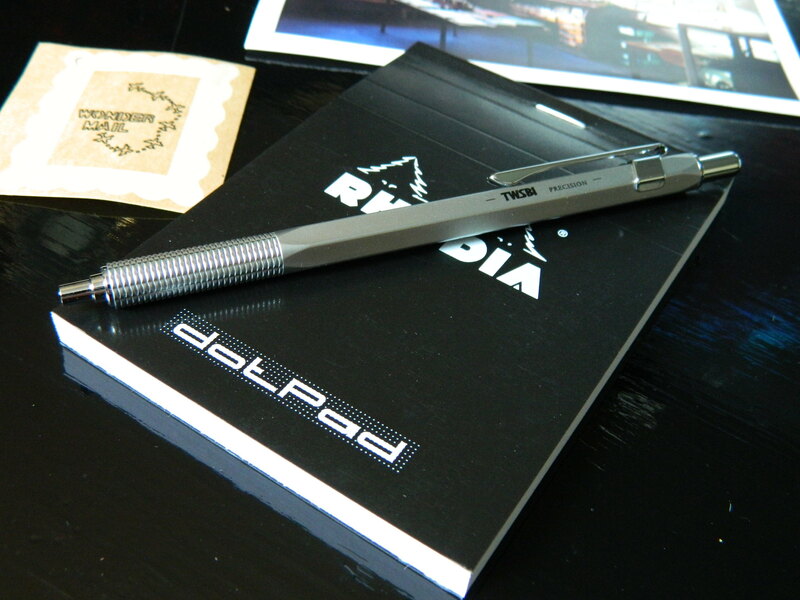 This kind of design is pretty common really, the Caran d’Ache is a nice pen and almost identical, and then I think Rotring do a very similar model too; but somehow I prefer the TWSBI, and I have always been a fan of the Space Pen refills.